Hand forged iron is how every Signature Iron Door is crafted. A single iron entry door with wrap around side lights and transom is an elegant way to open your home. 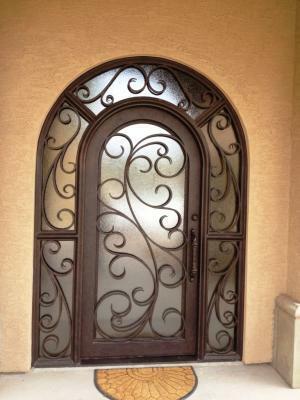 This is a Medina style door, one of our most popular, done for a customer near Carson California. We have a variety of styles and design options for you to work with, plus a full inventory of our most popular designs. Call us to speak with a sales representative about how to acquire a Signature Iron Single Entry Door with wrap around side lights and transom for your home.